Shrove Tuesday Pancake Bell. Scarborough, Yorkshire, England. 1974. In Scarborough the curfew bell, which hung at the entrance to the Hospital of St Thomas the Martre, used to be rung every morning and evening at six o'clock, and in particular at twelve noon on Shrove Tuesday as a signal to start frying the pancakes. 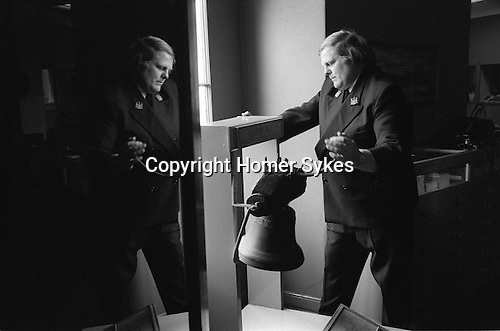 the town museum, and, since then, with the exception of the years 1939-45, the Pancake Bell, as it is now called, has been rung annually at midday by the museum staff.